All seven Mosaics are within this shot. We are on our way back from a glorious handful of days at Panama City Beach. We needed the break as a family to reconnect outside of the monotony routines can bring, and I needed a safe place and time to begin weaning myself off of Zoloft. While I can feel the effects of my half-dosage, I'm thankful to have started this process of healing and freedom-- from both post-partum depression and from medication. I also took these few days to experiment creatively. I am a firm believer in pursuing creative rest and revitalization by changing gears rather than taking a "break" (though sometimes a break is needed--I understand and recognize that, too!) . I was abuzz with the excitement of Dothan's murals when we reached the beach, energized by the impact more public forms of art can have and the conversation they create. 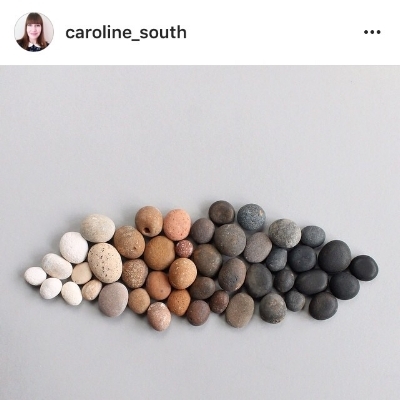 When I set that beside learning about Andy Goldsworthy in school and following Caroline South on Instagram for a couple of years, it was a "perfect storm" (pun intended, though thankfully, Hermine mostly missed us) for me to try something public and temporal out of found objects. I made five mosaics in three days, and they became larger and more complex along the way. Each of them was made from shells and fragments from our little beach area which I collected as I went along. The first installment was a small grayscale of shells, grown from my recent blog article and current fasination with contrast. For this mosaic and the next, I collected a handful of shells in the range I wanted before I got started, and I worked almost exclusively from that handful. Installment two, Beach Art II, was also a light to dark scale, this time from white/cream to orange/red. This was probably the most prolific set of colors on the beach. It was an excellent exercise to arrange a color from light to dark and practice seeing the scale of value. Saturday was a unique day in the process because it was a day of collaboration. First, when I arrived at the beach, I found that a mystery artist had added his or her installment to the "gallery" on shore. I'm not sure how to express how pleased I was to find that my work had sparked another person to create. I don't know who this artist is, but I'd like to think he or she is a child, maybe just eight or ten years old, who listened to that creative voice. And I hope it was met with great encouragement by lookers on. I certainly think it was a brilliant addition! This day was also unique because my dear friend Jane Ellen joined in, too. We were spending a bit of time catching up, and she was delighted to do her own little masterpiece while I continued my project. Above to the left you can see it on the day she visited. To the right is her mosaic after it was rained on overnight while the tide came in and out again. I love this subtle, settled effect! I did two pieces on Saturday. The first, Beach Art III, explored the full range of colors I could find on our beach-- ranging from blacks, charcoals, and navy to purple to whites and creams to yellows, oranges, and reds. I wanted to do more with the purples, which are found on the inside of shells I know commonly as "angel wings," but they were to hard to come by in any quantity since I was always dodging weather and nap times to work. Beach Art IV returned to the grayscale, but changed form to a circle. The new challenges here were the increased quantity of shells needed and attempting to keep the piece close to truly round. Beach Art V was the largest of all, about a foot square, and again explored all the colors of the beach. It is arranged from warm to cool with neutrals in the middle. Precious purple shells are interspursed throughout as a fun "pop." I was racing the rain to make this one for sure, listening to the thunder come closer and closer, but I think the reduced precision actually enhanced the overall effect. The changing of the tides is already effecting the pieces, changing their shapes and arrangement. And yet, as I head home, I know that for another day or two at least, there will be a little gallery in the sand. It is evidence of human creativity, of play, of experimentation, and of collaboration. I started this just as a way to play. I wanted to continue thinking about the grayscale, and I wanted a little creative outlet in the sand. I didn't start this as a "project," "installment," or "collaboration." And, yet, it became all of those things. I found myself asking Hubster yesterday if I could duck down to the beach during naps yesterday "to work on my final piece." I found joy and peace crawling about in the sand, doing something so tactile, so straightforward, and yet so complex. It's not unlike quilting, really, except I got a sun burn! ha! I've shared on my personal Instagram about my journey through postpartum depression these last 6 months and about reducing my dose of Zoloft this weekend. I think these shell mosaics gave me a place to direct my anxiety about taking that step toward freedom and healing. They also encouraged me to ponder my identity as an artist. I've never been one to stop creating on trips-- I always bring knitting and/or watercolors. But something about creating a much more public piece this time made me declare aloud that I was an artist, and I had work to do. It was different than hobby art or even commissioned art. This was simply art for art's sake-- art to encourage myself and other beach goers. We're nearly home now; we're back in the land of recognizable road names. I'm bringing home a refreshed family and marriage, a refreshed heart, refreshed creativity, a new quilt worth of fabric, new friendships, and an eagerness to get stitching! I'll call that a winner of a weekend! God is good! I hope these days have been as sweet for you, my friends. PS Don't forget to join me @stringandstory on Instagram for daily updates on my makings and to give a shout my way--I'd love to hear from you and see your work!